Faith in Vermont: Save the Librarians! Ilsley Public Library now has a self-checkout terminal: a computer station where you scan your own library card and the barcodes of the books you’re checking out, without ever having to interact with another person. It’s what I longed for when we first moved here. 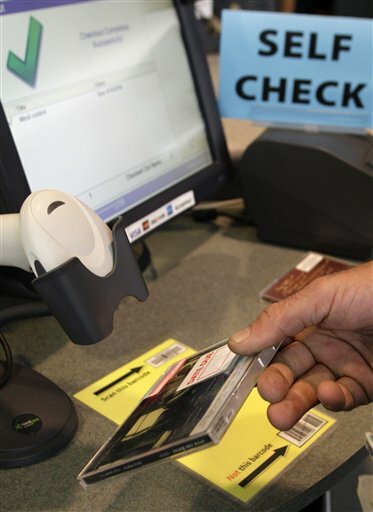 When we lived in California, every library had multiple self-checkout terminals. In the children’s room of our local library, the librarians weren’t even able to check out books for you; they were on hand as reference guides and story-time leaders. To check out books, you had to use the computer. And going to the library with my girls, who generally check out 20 books at a time, self-checkout was just fine; desirable, even: the girls kept busy and out of trouble by helping hand me the books and scan the barcodes. Flash forward to our first visit to Ilsley: as we approached the circulation desk with our tote bag full of books, I searched -- in confusion that became panic that became irritation -- for the self-checkout terminal, before resigning myself to handing our books to an actual librarian. Now, at last, Ilsley has one self-checkout terminal, on the adult floor. And when I first saw it, I felt sad. Over the course of this year, I’ve come to treasure our interactions with the wonderful staff at both Ilsley and Sarah Partridge Libraries. Most of the librarians no longer ask for my card when we check out; they know my daughters and me, and pull up our records by name. They’ve ordered new books for the library based on recommendations from my oldest daughter, they’ve helped that same daughter get her first library card, they’ve called me at home to let me know that they were holding a book we’d accidentally left behind. A self-checkout terminal may be convenient, but it can’t do any of those things. My ambivalent reaction to the self-checkout terminal may indicate that I’m getting old and starting to fear change. But I think it’s more a sign that I’ve entered a dangerous stage in my Vermont residence: the point at which I’ve lived here long enough to feel nostalgic for things that I haven’t lived here long enough to fully understand. If I don’t watch it, my affection for Vermont might become patronizing. Most of us, when we visit or move to someplace new, carry with us at least a little bit of a stereotype about that place. This is particularly easy to do with Vermont, whose name easily conjures up images of green hills, snowy slopes, red barns, dairy cows, stunning foliage -- the whole “Moonlight in Vermont” fantasy. I certainly moved here with those expectations. And Vermont does a stunningly good job of living up to its own hype, since it genuinely does contain gorgeous scenery, small towns, and working farms. But live anywhere long enough, and what was once charming and unique becomes the norm. When we first moved to Vermont, it seemed like we lived in such a small town. I couldn’t get enough of the barns and the cows. It was like nowhere I’d ever lived: no big box stores, no multiplexes, no four-lane highways. Now, my small town doesn’t seem so small anymore. Sometimes I go out and don’t run into anybody I know. There are more houses than farms. We even have some chain stores: a Rite Aid, a TJ Maxx, and (gasp!) a McDonald’s. I’ve had a chance to explore Vermont a bit, and there are plenty of towns much smaller than mine. In fact, with its 8,000-something population, Middlebury is the 12th largest town in the state. And NOW, our library has a self-checkout terminal. So I’m feeling nostalgic for something that hasn’t existed here in a long time, something that might not even be desirable to most of the community: I wish for more farms, fewer chain stores, only live librarians. It’s the attitude of a Westerner who travels to Africa and is disappointed to see Masai tribesmen chatting on their cell phones; a nostalgia based on stereotype. Because who am I to deny Middlebury its economic development, to deny the library its technology? Who am I, having lived here barely two years, to judge what this community wants or needs? The issues underlying what’s happening in this town, this county, this state, they’re incredibly complex. I think the challenge to having lived in a place -- and loved a place -- just long enough to feel nostalgic, is to keep my mouth shut for at least another decade. Maybe by then I’ll have earned the right to wish for bygone days. Or maybe I’ll just be really thankful for that self-checkout terminal. Faith Gong has worked as an elementary school teacher, a freelance photographer, and a nonprofit manager. Since moving to Addison County in 2011, her work has involved caring for a house in the woods, three young daughters (with another on the way), one adorable puppy — and writing for her blog,The Pickle Patch.